If you love Sydney’s famous annual Sculpture By The Sea exhibition, then it’s well worth checking out its rainforest equivalent – Sculpture At Scenic World. 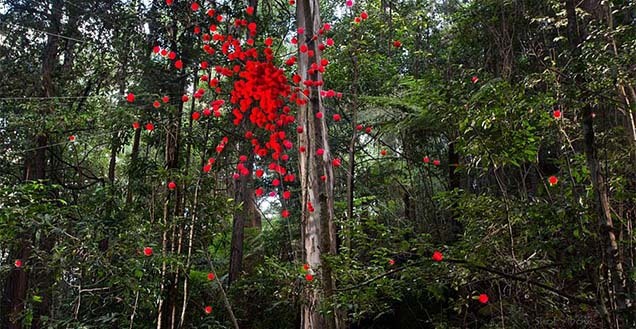 It’s the annual and highly unique art exhibition held at Scenic World in Katoomba, high in the Blue Mountains – home of The Three Sisters – in which eye-popping and thought-provoking sculptures are installed on the forest floor. Now in its fifth year, this year’s exhibition features an eclectic mix of vibrant works. Standouts include the an explosion of red pom pom balls suspended in air called ‘Kapow’, the giant rainbow tunnel made of coloured string and tiny tinkling bells titled ‘Tunnel Of Love’, a UFO-like sculpture of a quasar, and a mesmerising scattering of over 200 mirror tiles, reflecting the sky and the forest canopy. There’s also an audio-installation of little singing objects hanging from the trees, as well as work featuring a scattering of hundreds of $50 notes, forcing the viewer to reflect on their personal connection to money. Exhibition manager Justin Morrissey told Hope 103.2 that artists from all around the world contribute their work to the unusual exhibition. He said the $20,000 prize pushes the contributing artists to really push the boundaries of their art. They have to think specifically about their use of colour, so that their sculptures stand out among the green of the rainforest environment. Winner of this year’s prize was Michael McIntyre for his “startling and spectacular” installation of several hundred painted, woven baskets, which took months to create. Visitors can take the cable car or railway – the world’s steepest – down to the rainforest area, where they walk among boardwalks to see the sculptures. The event is ideal for families, with the intriguing artworks attracting people of all ages, and sculpture workshops for children are held in conjunction with the exhibition. 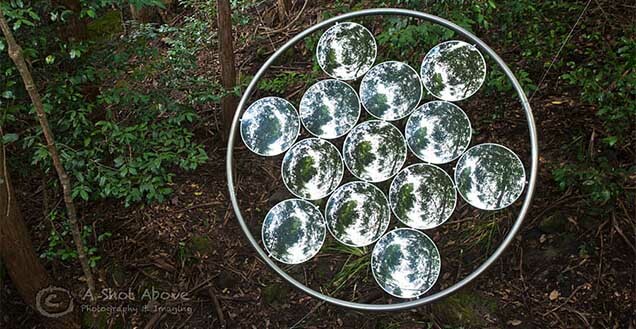 Sculpture at Scenic World is open until Sunday, May 8.